Dodge's 2010 Charger police car plays a role in Chrysler's plan to make its fleet business more profitable. When the Charger is redesigned this year, the automaker expects an increase in government and commercial fleet sales. DETROIT -- Chrysler Group will boost efforts to market the Dodge Charger to police departments, part of a larger drive to sell more vehicles to government and commercial fleets, said Peter Grady, Chrysler's top dealers executive. "We plan on going after the police market pretty hard," Grady, the Chrysler vice president in charge of fleet sales, said in a speech to the NAFA Fleet Management Association expo here. The re-engineered 2011 Charger is scheduled to arrive in the fourth quarter. 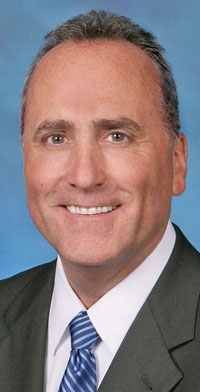 Chrysler plans to cap its sales to rental fleets, says Peter Grady. Chrysler will cap sales to rental car fleets in order to concentrate more on government and commercial fleet sales, Grady said. Chrysler has leaned on less profitable sales to rental fleets too heavily in the past, a practice that has hurt residual values. Chrysler is refocusing its fleet business on the government and commercial sectors in an effort to preserve residual values and strengthen brands, Grady said. Dealer sources said fleet sales spiked in the first quarter, accounting for 58 percent of total Chrysler sales. Grady called the fleet market "overheated" because many rental companies replaced high-mileage vehicles. Grady predicted fleet sales would normalize at 2.1 million units in an 11 million unit industry for this year, or about 18 percent. Chrysler has set a goal of 25 percent sales to fleets. Chrysler's alliance with Fiat opens new opportunities to fleets because, he said, Fiat is strong in compressed natural gas technology.